Family of Spanish pilot killed in crash say he only recently took up position as captain with Air Lada, the company which owned the plane involved in Thursday’s crash. FLIGHT SCHEDULES ARE RETURNING to normal at Cork Airport this morning, after the airport reopened following Thursday’s fatal plane crash. Intending passengers are still being advised by the airport to contact their airline before travelling to the airport in case of delays or changes. The investigation into Thursday’s crash, which killed six people and injured another six, continues today. The Air Accident Investigation Unit, which operates under the Department of Transport, has recovered the Manx2 plane’s two black box recorders. 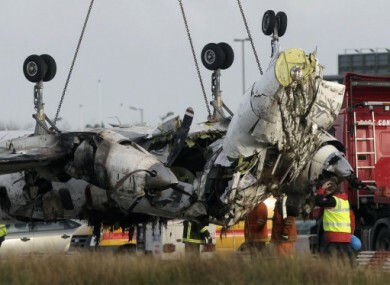 These will now be analysed for further information on the flight and its final moments, the Irish Times reports. The data recorder will be processed in Meath, but the cockpit voice recorder has been sent to the UK for analysis. Spain’s Regio7 reports that the pilot’s family said although he had held his license for some time, he had only recently begun captaining flights. Spanish pilot Jordi Sola Jopez, 31, was killed in the crash. He had worked as a flight instructor in Sabadell before taking his current job with Air Lada, which owned the plane involved in the crash. Two of the crash survivors were released from hospital yesterday, but the remaining four are still being treated for their serious injuries. A hospital spokesperson told TheJournal.ie that their condition is serious, but stable. The priest who attended the crash site has spoken of his shock upon arriving at the scene. The parish priest of Ballyphehane, Fr Mick Murphy, administered the last rites to the six deceased and said he never anticipated being involved in such a tragedy. He told RTÉ’s News at One yesterday that although he had spent time with the Irish Army in Lebanon, he was not prepared for this. Email “Flights resume at Cork Airport as investigation continues”. Feedback on “Flights resume at Cork Airport as investigation continues”.